We offer our clients the complete electrical installation package including free advice and competitive pricing. From electrical faults, repairs and maintenance to new installations, we can take care of all the electrical needs within your property..
We can proudly say that our services are widely used and relied upon throughout the area. 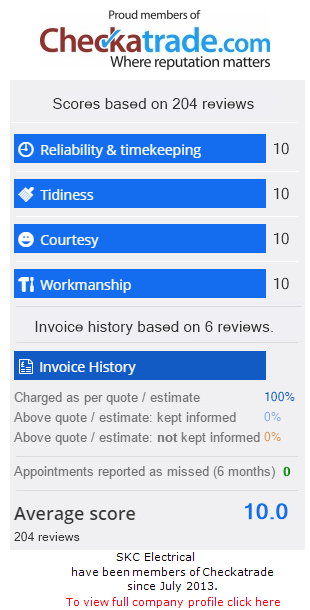 Have a look at what our customers say..
Our expert team are able to bring a combination of industry experience, expertise and skill to every job and project to guarantee the best results..
We will happily provide you with all the time and advice you require to ensure you need are professionally and efficiently met..
quickly and efficiently to your needs? SKC Electrical are specialists in all aspects of electrical installation work. We offer customers throughout Surrey and all surrounding areas with a complete electrical installation service, including free advice and competitive rates. Our service range extends from single socket installations through to complete rewiring projects and system installations. As we are fully trained and qualified within the trade, we are able to apply our knowledge and skill to any domestic demands. Whether you are looking for the right electrical solution for your home or business, you have come to the right place. Our dedicated electricians are fully equipped with all the tools and expertise required to work safely and confidently within any environment. We can guarantee that all of our electricians work in accordance with approved Document Part P of the Building Regulations. In addition to the guarantee of a safe service, you can expect a superior level of craftsmanship and attention to detail. Through years of experience, we have mastered the ability to work quickly but carefully. Meaning that your electrical needs will be met on time, within budget and most importantly, within all relevant health and safety regulations.